London to Edinburgh . . .
Buy from www.loco2.com & pay the official price with no booking fee. Bookings open 8-12 weeks ahead. Read this quick guide to understand the difference between Advance, Off-Peak & Anytime fares. Mobile Tickets: If you select Mobile Ticket you can simply show the ticket on your smartphone, tablet or laptop. 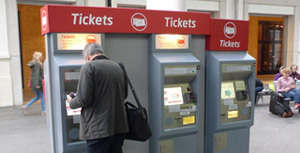 Or collect your tickets at any main station from the self-service machines: Touch collect tickets on the screen, insert your credit card, enter the reference & your tickets will print. Should work fine with non-chip-&-PIN overseas cards. You need the original credit card to collect tickets. 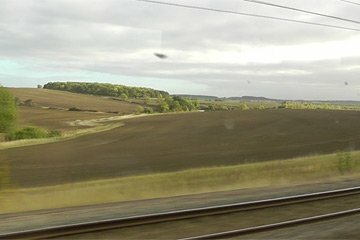 An inter-city train links London & Edinburgh at up to 125mph almost every 30 minutes through the day, 393 miles in 4 hours 20 minutes, city centre to city centre with zero check-in. Flying means 4 hours of local train to the airport, security searches, flight & then a bus - the train is less hassle, cuts your CO2 emissions by 84%, and is a real travel experience. This page will help you buy the cheapest tickets and get the most from the trip. 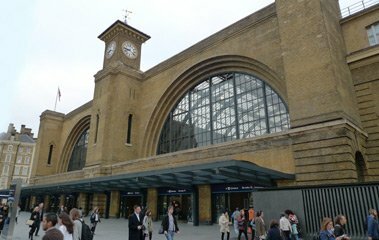 Trains leave London Kings Cross every hour or at times every half-hour 07:00-19:00 and arrive at Edinburgh Waverley, right in the centre. Typical journey time 4h20, but it varies. 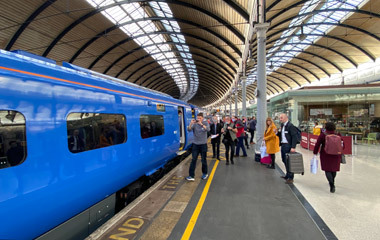 You can check departures for your date of travel with LNER, the government-owned company which runs these trains, they took over from Virgin Trains East Coast in June 2018. Booking for most British trains usually opens up to 3 months ahead, but on LNER you can often now book up to 6 months ahead for travel on weekdays - though still 3 months ahead for travel at weekends. There's also an overnight sleeper between London & Edinburgh, see the Caledonian Sleeper page. Map showing London Kings Cross - Map showing Edinburgh Waverley. 2nd class Advance fares start at £26.50 each way. 1st class Advance fares start at £66 each way. Advance fares are only valid on the specified train, no refunds, limited changes to travel plans, price varies depending how far ahead you book & how popular that date, day or the week and train is expected to be, just like air fares. Anytime tickets cost £161.50 one-way or £323 return, valid on any train you like. Super Off-Peak tickets cost £146.40 one-way or £147.40 return, valid on any train you like at weekends or on Mondays-Fridays any northbound train except those due to leave London before 09:06 or from 14:59 to 18:59 (18:15 on Fridays), or any train southbound except those due to arrive in London before 11:17. That restriction correct at time of writing, but please confirm online. Super Off-peak, Off-Peak & Anytime tickets are always available in unlimited quantities at these fixed prices, even on the day of travel, they cannot sell out. You can use them with or without a reservation on any train on which they are valid. 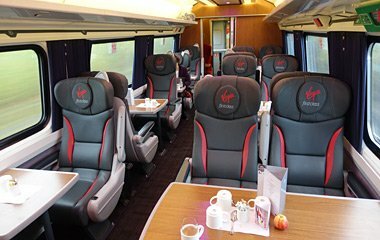 Buy tickets from www.loco2.com or www.lner.co.uk and pay the official price with no booking fee. UK & overseas payment cards accepted. If you select Mobile Ticket you can simply show the ticket on your smartphone, tablet or laptop. 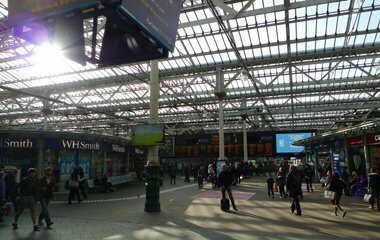 Or you can collect tickets from the ticket machines at London Kings Cross, Edinburgh Waverley, and most other British stations. www.loco2.com and train operators' own websites such as www.lner.co.uk sell tickets for all routes and all operators, at the same official prices with no fee, which is why I recommend them. Most other independent retailers charge a booking fee. A word of warning if booking 8-12 weeks ahead and you see no fares under £146. Wait! The 8-12 week trap explained. Kings Cross station. 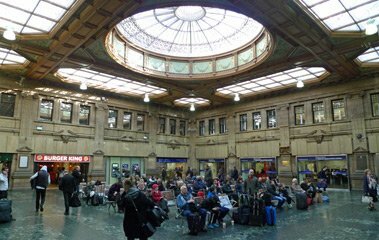 The ugly 1970s concourse has been removed, revealing Lewis Cubitt's elegant station facade of 1852. More information on the station's history. 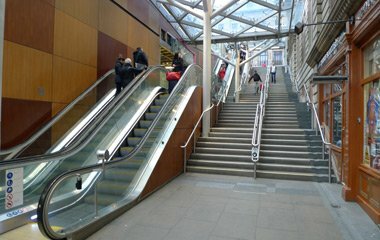 A spacious new concourse has been built alongside the original station, on the left hand side as you look at Cubitt's original facade. This photo was taken from the balcony where you'll find various food outlets. The ticket office is on the right of the photo. The Harry Potter trolley is almost dead centre in the photo, and the Parcel Yard pub is at the back. 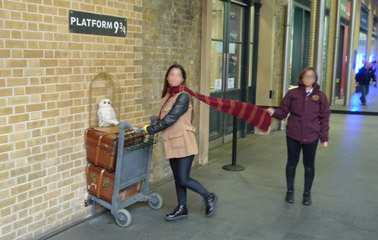 Access to or from the trains at Kings Cross is though automatic ticket gates, so have your ticket handy. LNER (formerly Virgin Trains) 1st class lounge... 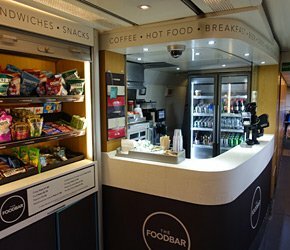 Anyone with a 1st class ticket over £10 for travel via the East Coast route can use the LNER first class lounge with complimentary tea, coffee, snacks & soft drinks. The door to the lounge is to the left of the blue neon glow (actually a row of ATMs) in the centre of the concourse photo above. The lounge is upstairs, accessed via a lift. 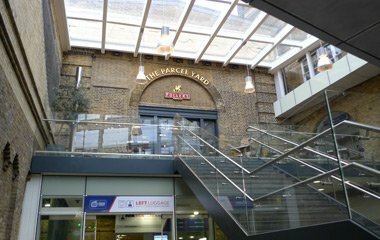 The Parcel Yard... 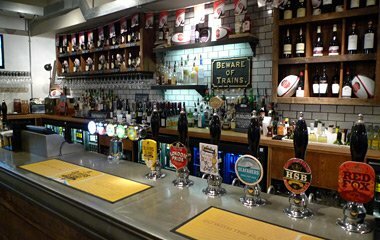 If you can't get into the first class lounge, look no further than the Parcel Yard pub at the back of the new concourse, it's a great place to have a meal or beer while waiting for your train. Or for a really special meal, try the Plum & Spilt Milk restaurant on the ground floor of the Great Northern Hotel, with an entrance directly off the new Kings Cross station concourse. 1. The train leaves Kings Cross and immediately plunges into the short Gasworks & Copenhagen tunnels. It then it accelerates through the London suburbs. 2. 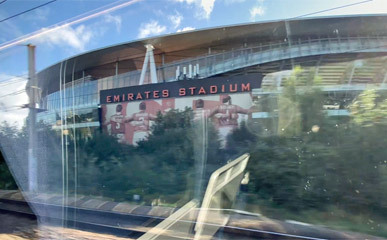 A few minutes after leaving Kings Cross, look out for Emirates Stadium on the right, the home of Arsenal Football Club and the third largest football stadium in the UK after Wembley & Old Trafford. 3. 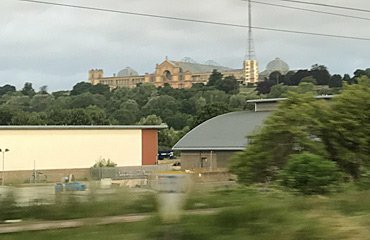 Alexandra Palace with its large radio & TV mast is on the left 10 minutes or so after leaving Kings Cross - it was from 'Ally Pally' that the BBC broadcast the world's first regular public television service in 1936. 5. 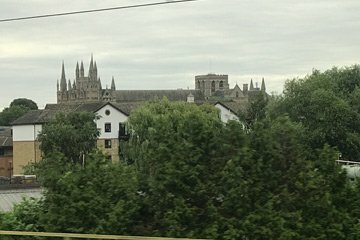 As you approach Peterborough & cross the River Nene 76 miles from Kings Cross, look out for the squat towers of Peterborough cathedral which are just visible over the city roofs on the right hand side of the train. 6. 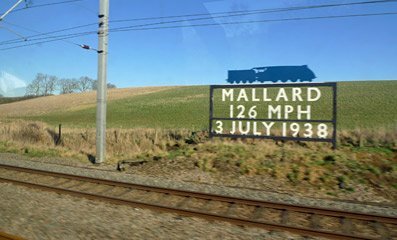 On 3 July 1938 on a stretch of the London-bound track, LNER A4 locomotive Mallard set the world speed record for steam trains, 125.88 mph, a record which still stands today. Look out for this sign on the right hand side a few miles south of Grantham, marking where history was made. 7. York station, 188.5 miles from London - if you want to break up the journey, this is the place for a stopover - see travel tips. The two towers of York Minster are just visible over the top of the station's beautiful 19th century roof. York is also home to the National Railway Museum, www.nrm.org.uk. 8. A blur at 125mph... 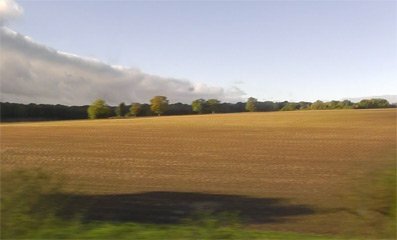 The famous London to Edinburgh Half Way sign, on the right about 7 miles north of York. 11. Newcastle... 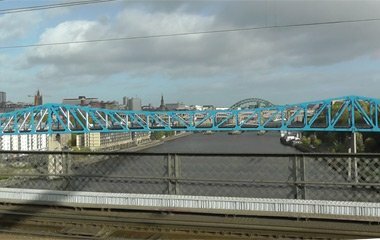 The train slows & rumbles across the River Tyne into Newcastle Central, 268 miles from London. 13. 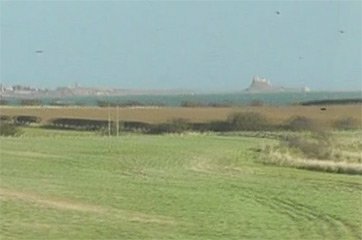 Lindisfarne castle just visible through the haze. 14. 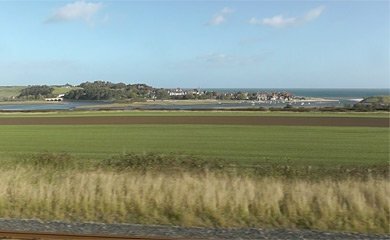 The train races across the Royal Border Bridge over the River Tweed approaching Berwick. Designed by Robert Stephenson, this impressive 659m-long viaduct was opened by Queen Victoria in 1850. As you can see above the best views as you curve onto the bridge are from the right hand side of the train when going north. 15. 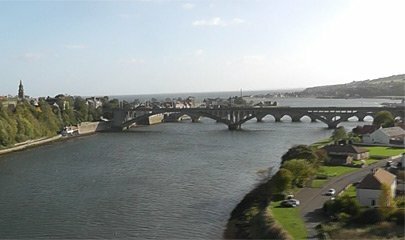 The River Tweed & city of Berwick. Just beyond these bridges, the Tweed flows into the North Sea. 16. 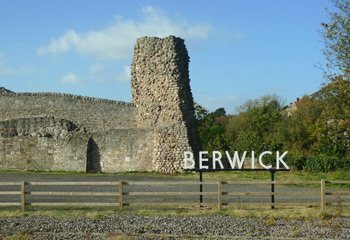 Berwick, where part of the castle was demolished to make way for the station. 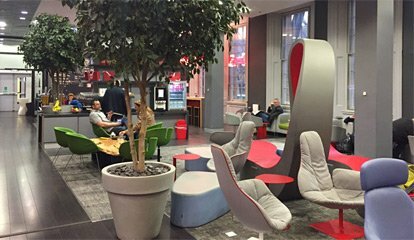 LNER (formerly Virgin Trains) 1st class lounge, freshly refurbished in 2016. 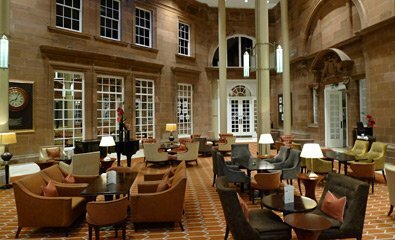 1st class passengers can use the lounge at Edinburgh with any kind of first class ticket valid on LNER, including Advance tickets. 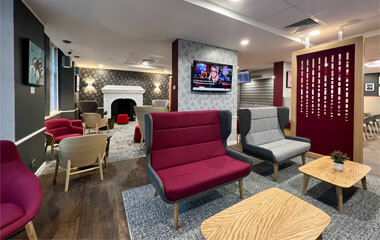 Lounge photo courtesy of Virgin Trains. 1st or standard class? Standard class is perfectly adequate, indeed it's very comfortable on this route - LNER has perhaps the nicest standard class interiors of any British train. First class is usually priced for business travel, but if you pre-book you can find some really affordable first class Advance tickets. First class gets you wider seats with more legroom, fewer families & kids and more businessmen & laptops. 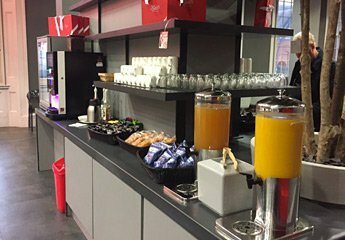 You'll get complimentary hot food and wine served at your seat on weekdays, although just tea, coffee, sandwiches & biscuits at weekends. Another advantage of first class is that you can choose a solo seat if you're travelling alone or a face-to-face table for two, by far the nicest arrangement for couples. Sit on the right hand side of the train going north, left hand side southbound, if necessary ignoring your seat reservation and simply sitting in any unreserved seat. 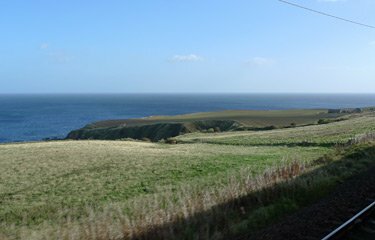 All the best views - meaning the coastline, the lineside signs and Royal Border Bridge - are on this side. 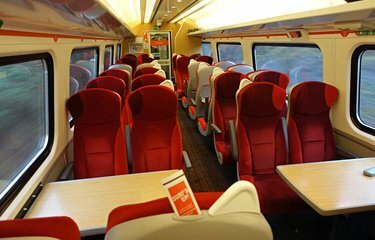 You'll find seating plans here for the InterCity 225 electric trains used on most London-Edinburgh departures by LNER, and for the InterCity 125 (HST) diesel trains used on those services which continue to or from Aberdeen or Inverness. The first class cars K, L & M are usually at the London (south) end of the train. Want to stop off on the way? The obvious choice for a stopover between London & Edinburgh is York. It's a fabulous city to visit, and it's home to the UK's National Railway Museum, www.nrm.org.uk. 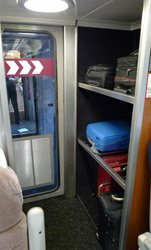 You can leave your luggage at a left luggage facility near the station, leftluggageyork.co.uk. To see where else you might stop off, see this excellent map of the UK train network. You cannot break your journey with the cheapest Advance tickets, so simply buy two separate tickets, London-York and York-Edinburgh for the specific trains & dates you want. The more expensive Off-Peak & Anytime tickets do allow stopovers, but check carefully that the ticket you buy covers you for what you want to do. Buying separate tickets is a safer bet for newbies. Last minute upgrade to 1st class? 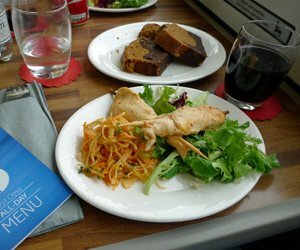 If you have a cheap Advance ticket for standard class, you can bid for a last minute upgrade to 1st class with food & drink included by downloading the Seatfrog app onto your smartphone at https://seatfrog.com/lner.html. This is new from September 2017, it's only possible on trains with plenty of empty 1st class seats, but see how it goes. But if you want to be sure of travelling in 1st class I'd just book a normal 1st class advance fare. Feedback would be appreciated! 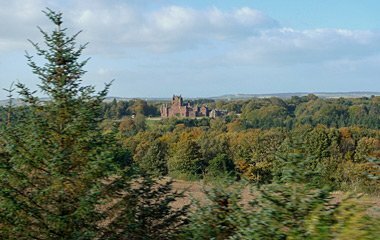 The East Coast Main Line as railwaymen call it, was built around 1850 by three railways working together: The Great Northern from London to just north of Doncaster, the North Eastern Railway from there to Berwick, and the North British Railway from Berwick to Edinburgh. All three railways became part of the LNER (London & North Eastern Railway) in 1923 when Britain's many small railway companies were grouped into the Big Four regional companies, the LNER, LMS, GWR & Southern. The Big Four were nationalised in 1948, becoming British Railways, shortened to British Rail in the trendy 1960s. Privatisation in 1995 has seen several companies run the East Coast franchise, and was operated by Virgin Trains East Coast, 90% owned by Stagecoach, 10% by Virgin Group, until June 2018. It's now for the moment run by a government-owned company and rebranded LNER, a nod to the old historic LNER. The line is now electrified and uses InterCity 225 electric trains inherited from British Rail, although you'll still find some classic InterCity 125 diesel trains running 'under the wires' if your train is a through train beyond the electrified section to or from Inverness or Aberdeen. More information at en.wikipedia.org/wiki/East_Coast_Main_Line. The World Steam Speed Record... The LNER ran its famous A3 & A4 steam locomotives on the London to Edinburgh route, and it is the celebrated A4 class Mallard which still holds the World Steam Speed Record, 126mph achieved in 1938 on a section of the same London-Edinburgh line that you travel over today. Today, Mallard can be found in the National Railway Museum at York (www.nrm.org.uk). More information at en.wikipedia.org/wiki/LNER_Class_A4 4468_Mallard. 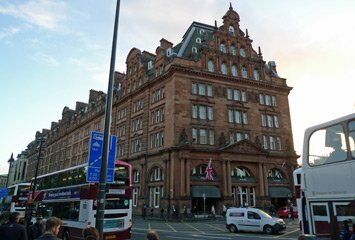 Two rival luxury hotels glower at each other from opposite ends of Edinburgh's famous Princes Street. Both have 5 stars, both are great places to stay. And both are - or at any rate, were - railway hotels. 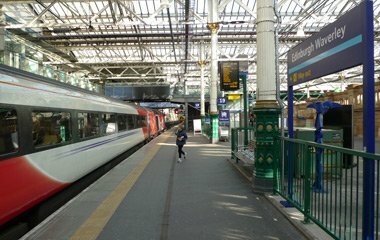 The North British Railway arrived in Edinburgh via the East Coast route and built the North British Hotel on Princes Street adjacent to Edinburgh Waverley station. 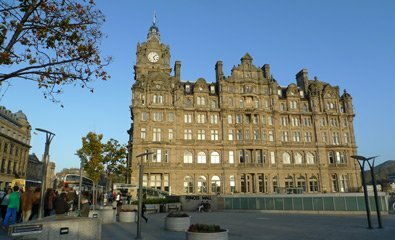 Today, it is Rocco Forte's Balmoral Hotel, with luxury rooms and a refined air, but still handy for travellers arriving at Waverley station, and with an enviable prime location. 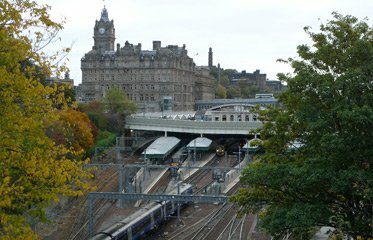 Meanwhile, the Caledonian Railway arrived at the other end of Princes Street at its own Princes Street Station. It built its own grand hotel, the Caledonian, directly above the station. 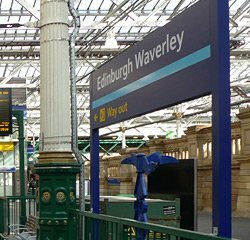 Princes Street Station was never as busy as Edinburgh Waverley and in 1965 the Beeching axe fell, the station closed, and the remaining trains were diverted into Waverley. The tracks are now occupied by a car park, the old railway approaches by a roadway. But the hotel remains, and the Waldorf Astoria Caledonian Hotel has expanded onto the ground floor into what was originally the station itself. You can now order a cocktail in a carpeted atrium which was once the cigarette-end-strewn station concourse, pictured below right. The hotel's smaller bar is located in what was formerly the main pedestrian entrance to the station - which explains why it's so narrow! I've stayed at both these rival hotels, and both are excellent - but the Balmoral seems a touch too quiet and rarefied to me, the Caledonian a more vibrant and characterful place, and I loved the Galvin Brasserie deluxe. So next time I'm in Edinburgh you'll find me at the 'Caley' - but feel free to disagree! The Peacock Alley lounge at the Caledonian Hotel was once part of Edinburgh Princes Street station concourse. The rival Balmoral Hotel adjacent to Waverley station, originally the North British Hotel. There's another classic railway hotel at Kings Cross, re-opened after years or dereliction refurbished top class standards in April 2013. The Great Northern Hotel was the LNER's London hotel, right next to the station. I can highly recommend it, not least because on each floor you'll find a pantry with complimentary coffee, tea, cake and jelly-babies... 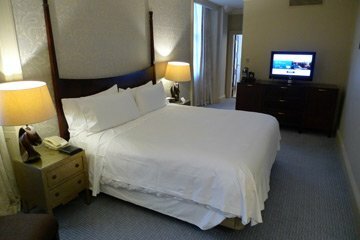 Check the reviews and book the hotel.